WarioWare: Twisted! (AKA Mawaru Made In Wario -まわる メイドインワリオ, Mawaru Meido in Wario, lit. 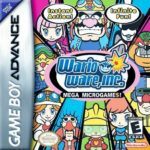 “Turning Made in Wario” in Japan) was released for the Game Boy Advance (GBA) back in 2005. It was developed by Nintendo R&D1 and published by Nintendo, of course. It is considered as one of the strongest additions to an already varied and insanely creative game series. It’s quite unfortunate that this Super Mario game never really got distributed to Europe. It would have sold like hot pie on a window. It can be said that this release for the GBA is one of the unique installments from this best-selling series. In WarioWare: Twisted! we have Wario going berserk and destroying his GBA after losing a game. He then visits Dr. Crygor to have his game fixed. Instead of fixing it, the game becomes a funky version handheld console. That’s about the time Wario calls his friends to create all the crazy micro games. Oh yeah, there are more than 220 of these micro games and they’re totally fun. Note that every game included in WarioWare: Twisted! has some sort of a gimmick. They’re called micro games simply because each game is really short. A lot of them only last for 5 seconds, really. The game cartridge has a gyro sensor built into it so you can twist your Game Boy Advance unit like a steering wheel. It pretty much works like the accelerometer that we can find in our smart phones today. It’s a piece of pioneering work and technology come to think of it. As you might have guessed, a lot of the games will make use of this tilting movement instead of just relying on the buttons on your GBA. However, there are plenty of micro games in WarioWare: Twisted! that still allows for a great deal of button mashing. So don’t worry. The games are insane and a lot of the instructions just pop up like “Shave the beard” or “chug the drink” and a lot of other bits of nonsense. Sometimes you only have a split second to decipher what you’re supposed to do before the game starts. If you do it too slow, then game over. It’s all utter madness that demonstrates Wario’s surreal sense of humor. WarioWare: Twisted! game has only been ported to Game Boy Advance.